Hosa's Drive Series uses Bluetooth 3.0 technology. 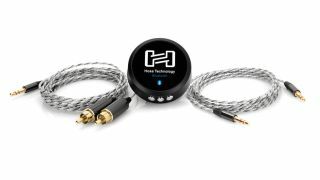 PRESS RELEASE: Hosa Technology, the leading innovator of analog and digital connectivity solutions for the modern musician, is pleased to introduce a new series of products designed to make it easier than ever for the worlds of professional and consumer audio to coexist: the Hosa Drive Series. Consisting of the Hosa Drive Bluetooth® Audio Receiver and a selection of portable cables designed to interface with everything from car audio systems to sound reinforcement and consumer audio playback systems, the new Hosa Drive Series takes music mobility to the next level. The Hosa Drive Bluetooth Audio Receiver operates on Bluetooth Version 3.0 technology to wirelessly stream music from a source—such as a smartphone or other portable music player— to a playback system with minimal lag or signal loss. The Drive Bluetooth Audio Receiver includes built-in track controls for added convenience. Resembling a small hockey puck, the easy-to-transport receiver is the perfect solution for interfacing a music playlist with car stereo systems lacking Bluetooth connectivity. Similarly, the Drive Bluetooth Audio Receiver makes it easy to interface with the AUX or other input on a home audio setup, as well as connecting with a professional mixer or sound reinforcement system via the board's input channels or 2-track returns. It's the ideal product for accessing multiple devices without disconnecting and reconnecting any cables. The Drive Bluetooth Audio Receiver plays music wirelessly for up to 10 hours and operates at transfer speeds up to 24 Mbps. The unit includes a 3.5 mm TRS aux cable for interfacing with external audio playback systems and a USB cable for charging. Pairing with smartphones and similar devices is quick and easy. Hosa Drive Series cables are available in 3.5 mm TRS to Same and 3.5 mm TRS to Dual RCA in 1.5-, 3-, 6-, and 10-foot lengths. These cables feature connectors made to fit media players and smartphones—even phones in protective cases. The metal connectors and easy-to-coil wires make Hosa Drive cables ideal for today's mobile lifestyle. Hosa Drive cables can travel in the car, a gig bag, or simply a jacket pocket—making it easy to establish an audio connection no matter where the road may lead. The Hosa Drive Stereo Audio Cable (3.5 mm TRS to Same) is the perfect choice for automotive connectivity. The cable features slim 3.5 mm connectors for devices with protective cases and incorporates all-metal connector housings for added durability. Similarly, the Hosa Drive Stereo Breakout Cable (3.5 mm TRS to Dual RCA) provides the same slim 3.5 mm connector and all-metal connector housings for added durability. Both cables use Hosa's Easy-Coil wire for tangle-free storage and travel. Jose Gonzalez, Hosa Technology's Product Manager, commented on the company's new Hosa Drive Series products. "The Hosa Drive Series has been created for the mobile lifestyle and is ideal for people who take their music everywhere. This ranges from audio engineers and gigging musicians to the guy who simply wants to listen to music on the road. This is a versatile, compact solution that makes it easier than ever for the worlds of pro and consumer audio to intersect." The Hosa Drive Series will be shipping in the first quarter of the year, with pricing still to be announced. Find out more on the Hosa Technology website.